Description: Level: Robot tool & cell designers, product, process designers and managers, digital design and manufacturing engineers, lean / agile system designers, industrial engineers, manufacturing and assembly system design engineers, quality control engineers, industrial designers, maintenance system design engineers and managers, and others. Ideal for undergraduate / graduate education and research in product / process design, DFM , DFA, DFQ, (Design for Manufacturing, Assembly, Quality), Concurrent Engineering, PLM (Product Lifecycle Management), CAD / CAM, TQM, industrial engineering, industrial design, robotics, and others. Several sections and cases could be used even for high school students and technicians learning/ exploring robotics, and customer-focused product/process design challenges. Industrial Sponsors/ Contributors include with special thanks to Gregory Martin, Account Manager, ATI Industrial Automation Inc., USA, ABB Robotics Inc., USA, Stäubli Corporation, USA, Trent, Nottingham, UK, CIMware Ltd. UK, CIMware USA, Inc., and others. 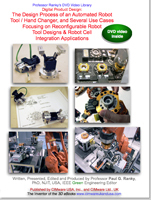 Contents: Reconfigurable robot tools, and their integration can save large sums of the total cost of a robot cell. In this video reconfigurable, automated robot tool / hand changer designs and some applications are discussed and demonstrated in detail. The focus is on small-batch sensory-feedback controlled assembly, part loading, and other flexible robot cells. Robot tools, or in more general terms, end-of-arm tools, hands, or robot end-effectors are general purpose, programmable or task-oriented devices connected between the robot wrist and the object, or load to be manipulated and/or processed by the robot. Reconfigurable robot tooling enables the robot to rapidly change its end effectors, or fingers of its end effectors, typically under programmable software control. This task is complicated by the fact that modern end-of-arm tools can include several power supply options, such as mechanical, electric, pneumatic, hydraulic and other, contact and/or non-contact sensors, offering touch / slip / force/ torque sensing, 2D or 3D vision, providing fast and reliable sensory feedback-control for the arm control computer to calculate safe and efficient trajectories. System Requirements: DVD-ROM: NTSC standard definition (SD) DVD video player for TV, or computer. Approximate length 32 min, in 16:9 widescreen format, also playable on a 4:3 regular screen, or any good computer screen (800 x 600 resolution, or better). Furthermore available in PAL DVD video, in streamed digital, and Apple Video iPod formats for mobile devices. The HD (high-definition NTSC and PAL) formats are also available. Please visit on the web www.cimwareukandusa.com for available formats, and further relating titles & products.products. Sample video clips in iPod res. : Clip-1, Clip-2, and Clip-3.